Hey guys!!! So due to life being very busy, I’ve been caught up with all the other little things going on and haven’t been able to write recently. Which has sucked. I had a dream last night about my Jamie jeans (which can happen often to me when working around them all day, sad I know). So I thought it was appropriate time to post up part three, all about my favourite jeans, the Jamie’s. I only discovered these over the last few months, and now I live in them! I secretly fell in love with them because I never thought Mom jeans really suited me at first and I wanted a nice high waisted jean with a skinny fit! They also have pockets so they don’t look like jeggings, which is another bonus! 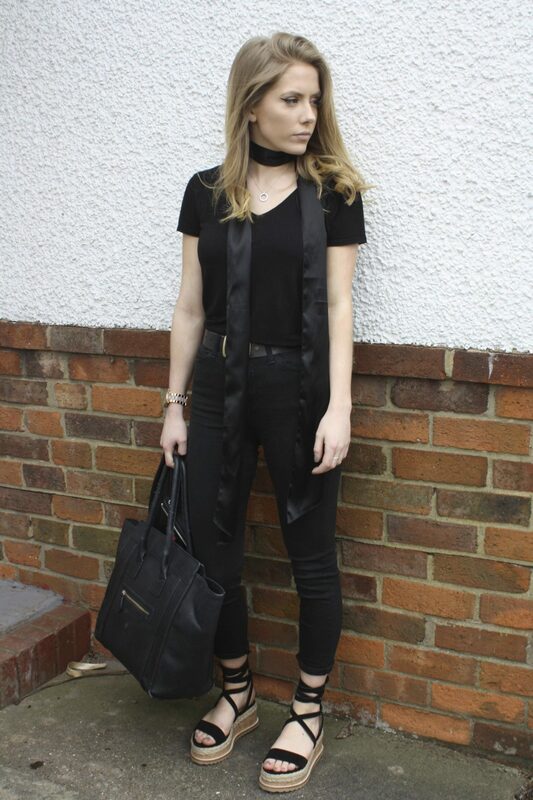 Here I’m wearing them with my black gold belt, Black v neck tee and my black neck scarf all from Topshop (you may be able to tell I get a lot of my clothes from Topshop and I like black). I dressed them with my new lace up wedge sandals also from Topshop, and they are possibly the comfiest sandals I’ve ever owned and they are so pretty (well I think so anyway). The best thing about the Jamie’s is that they are both high waisted and super comfy, I might be the only one but I’ve come across some horribly uncomfortable high waisted jeans in the past, where you sit down to eat and feel like you can’t breathe! But I have to say these are pretty great!! Some people are put off by the fact they are ankle grazers… But don’t be! With all the different leg lengths, going a leg length up means they fit just like a regular pair of jeans! (Although I like having them short for my little legs). I go away to lovely Cornwall soon so I’ll be posting up more over the next few weeks, I promise!!! Hope everyone is enjoying the little bit of summer we are having and fingers crossed it lasts!